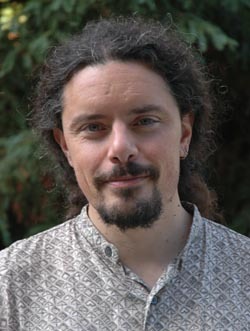 Associate professor of computer science Michael Mateas is a leading researcher in the area of artificial intelligence for computer games. Students at UC Santa Cruz majoring in computer game design--an interdisciplinary program that provides a rigorous background in the technical, artistic, and narrative elements of creating interactive computer games--are the lucky beneficiaries of a settlement reached in a class action lawsuit involving video gaming employees at Sony. As part of the settlement, UC Santa Cruz has been given $457,909 to be used to provide financial aid for students enrolled in the innovative computer game design program in UCSC's Baskin School of Engineering. Established in 2006, UCSC's program was the first of its kind in the UC system--and one of just a handful nationwide. Earlier this spring, Sony also donated six Playstation Portable Development Kits to UCSC's Baskin School of Engineering for use by students in the campus's game design studio. "This gift will allow us to attract the best students in the nation to come to UC Santa Cruz for our cutting-edge computer game design program," said Jim Whitehead, UCSC associate professor of computer science. Whitehead had a lead role in the design of the computer gaming major at the university. "The donation of equipment and the financial aid funds are strong indicators of Sony's belief in, and support, for our game design program, and gives our students extraordinary opportunities to be a part of creating new games," Whitehead added. The development of interactive computer video games is a multi-billion-dollar industry, catering to the legions of gaming enthusiasts with a steady output of new games featuring ever greater levels of technical sophistication. The UCSC program prepares students to take jobs in the computer game industry, and also gives them the option of pursuing graduate study in computer science. "I think it's fantastic to be able to offer scholarships to incoming freshman," said UCSC associate professor of computer science Michael Mateas, a leading researcher in the area of artificial intelligence for computer games. "We will use the money to increase both quality and diversity in the gaming program." "We look forward to working with Sony in the future, and hope that this is just the beginning of a nice collaborative relationship," he added. UCSC's computer game design program is administered by the engineering school's Department of Computer Science and also involves faculty in the Department of Film and Digital Media in the campus's Arts Division. The major requires a core of computer science courses to give students a solid grounding in the technical aspects of creating computer games. Additional courses in digital media permit students to focus on games from an artistic perspective. Electives allow students to explore relevant courses in art, theater, film, music, and economics.